Established in 2004, GOMA is a partnership between the five Gulf States of Florida, Alabama, Mississippi, Louisiana and Texas whose mission is to promote the ecological and economic health of the Gulf of Mexico by significantly increasing collaboration among governmental agencies, businesses, education providers and non-governmental organizations. GOMA promotes comprehensive ecosystem management and collaboration at local, state and federal levels to sustain the economic contribution of the Gulf region. Leadership from each of the five Gulf States forms the foundation of the Alliance, yet the day-to-day work is accomplished with the support of a small, expert staff of professionals and scientists. GOMA is additionally supported by the Gulf of Mexico Regional Partnership Federal Workgroup, comprised of representatives from thirteen federal agencies led by the Environmental Protection Agency, National Oceanic and Atmospheric Administration and Department of Interior. This structure provides a venue for collaboration and integration of federal efforts to address regional issues identified by the Alliance. It also allows its partners to focus funding priorities according to the needs of the Gulf, as well as a forum to share knowledge, expertise and reduce duplicative efforts. In addition to the Gulf States and Federal Workgroup, the Alliance relies heavily on non-governmental partners, including academic organizations, non-profit organizations and businesses, to provide expertise, resources and help implement projects. Acknowledging that the environmental and economic health of the Gulf of Mexico is contingent upon responsible management by the United States and Mexico, the Alliance actively works with the six Mexican Gulf States through several ongoing activities in Mexico. Through such initiatives, the Alliance aims to become a model for regional and international collaboration. GOMA’s six priority issues are: 1) water quality for healthy beaches and seafood, 2) habitat conservation and restoration, 3) ecosystems integration and assessment, 4) nutrients and nutrient impacts, 5) coastal community resilience, and 6) environmental education. These priority issues are addressed through several local and regional initiatives. The successes of its initiatives have noticeably affected change in the Gulf. For instance, work by the Alliance has contributed toward controlling the size of the dead zone in the Gulf, improved forecasting for the occurrence of harmful algal blooms and increased community resilience to natural hazards. The GOMA is engaged in a number of initiatives both in Louisiana and the Gulf region at large. Louisiana initiatives incorporate environmental education mini-grants, outreach and education mini-grants, and a professional networking web site, StormSmart Coasts. The Louisiana StormSmart Coasts web site is customized with information relative to Louisiana, including categories for “Before the Storm”, “During the Storm”, “After the Storm”, and “Funding.” An accompanying professional networking site, StormSmart Connect, provides a space whereby local decision makers can share information with one another through profiles, groups and forums. GOMA is involved in a range of initiatives aimed to help Gulf coastal communities build resiliency. Namely, GOMA and its partner institutions provide tools to help coastal communities better understand the risks and impacts associated with coastal hazards, including climate change. One of these is the Coastal Community Resilience Index, a self-assessment tool to help communities understand how resilient they are to disasters. The tool assesses the risks of coastal hazards to the natural, built and social environments of the Gulf Coast to better quantify these risks in the future. GOMA is also preparing an inventory of tools and capabilities that exist to address coastal hazards in the Gulf and identify important gaps and needs where new methods to enhance resiliency may be developed. The Alliance has held training workshops in the region to deliver relevant information to key stakeholders on issues related to its overall mission in an effort to bridge the science, policy and management communities on a regional scale. Additional regional initatives relate to the Mississippi River-Gulf of Mexico watershed, coastal and marine spatial planning, ecosystem restoration and National Ocean Policy issues. Specific initiatives related to research on the Deepwater Horizon oil spill include the Gulf of Mexico Research Initiative and the Gulf Coast Ecosystem Restoration Task Force. In response to the U.S. Ocean Action Plan, GOMA leaders produced the Governors’ Action Plans for Healthy and Resilient Coasts Plans I (2006), II (2009), and III (2016) to increase the integration of resources, knowledge and expertise to address regional priorities. The most recent Action Plan outlines a five-year regional plan to expand partnerships and sets a course for actions to improve the health of coastal ecosystems and economies of the Gulf through tangible results in ways that a single entity could not achieve. In November 2010, the Gulf of Mexico Alliance (GOMA) and partner organizations, including the Mississippi-Alabama Sea Grant Consortium, Louisiana Sea Grant, Texas Sea Grant, Florida Sea Grant, National Oceanic and Atmospheric Administration’s Coastal Storms Program and the Gulf of Mexico Program, developed the Coastal Community Resilience Index (CCRI) to help every community become more resilient. 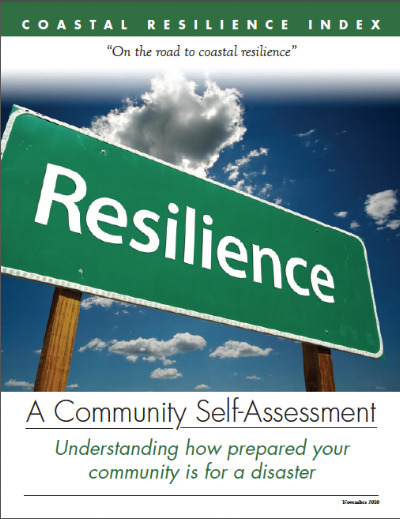 As a self-assessment tool, the CCRI aims to provide community leaders with a simple and inexpensive method of predicting whether their community will reach and maintain an acceptable level of functioning after a disaster. The CCRI can be used by experienced local planners, engineers, floodplain managers and administrators with existing sources of information available from their communities. The assessment may identify problems that a community needs to address before the next disaster and where resources could best be allocated. Results are presented as an index value that estimates the adaptability of the community to a disaster. The rating is designed to provide communities with an idea of how long it will take the community to provide basic services and reoccupy homes and businesses after a disaster. The assessment allows communities to test different scenarios, such as storms of varying intensities, to determine their capacity to respond and recover. The assessment takes into account infrastructure, critical facilities, transportation, community plans, mitigation measures, business plans and social systems. The result of the assessment defines the final index rating as Low, Medium or High resiliency that is unique to each community and, therefore, is not meant for comparison across communities.